Roulette Express is a roulette variation by Gamesys N.V. featuring one wheel and three balls. The player can bet on either each individual ball or parlay (called "Express") bets involving all three. There are actually three versions of Roulette Express, which I will explain in detail below. Single-ball bets — These are actually three bets, one on each ball. Each bet will win or lose based on the associated ball only. 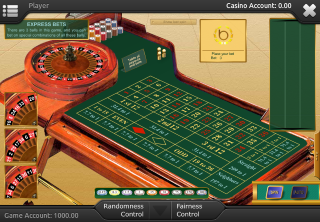 The player's wager is automatically divided into three. For example, a $3 bet on red would actually be three $1 bets on red, one per ball. The chip denominations are, conveniently, in amounts evenly divisible by three. Express bets — These single bets depend on all three balls winning, like a parlay bet in sports. For example, a bet on red would require all three balls to land in red to win. Straight — For this bet to win, all three numbers must be consecutive, from 0-1-2 to 34-35-36. Neighbors — For this bet to win, all three numbers must be adjacent on the wheel. Be warned that the BetVoyager help file incorrectly overstates the odds on the parlay bets, conflicting with what you can see on the felt. Based on some sampling, I find the rules on the table to be correct and the help file in error. What I call Standard Roulette Express is titled just "Roulette Express" by Gamesys. However, I need a way to distinguish it from the whole family of Roulette Express games, thus my inclusion of the word "standard." It is played on a single-zero wheel. There is no half-back on any losses if the ball lands in zero. The odds of the single-ball bets are the same as conventional single-zero roulette and already documented in my roulette page. The bottom line is each bet has a 1/37, or 2.70% house edge. The following table shows the number of winning combinations, probability, and house edge of each parlay bet. The total number of possible combinations is combin(37,3) = 7,770. Gamesys does not title games well, in this case it is titled as just "Roulette Express" in the game menu, but you can tell there is allegedly no house edge by the balanced scales on the game logo. Like the standard game, it is played on a single-zero wheel. Single-number bets pay 36 to 1, instead of 35. All other bets will push if the ball lands in zero. There are no combination bets involving a zero. For example no 0-1, 0-2, 0-3, or 0-1-2-3. This indeed makes the house edge on all straight bets exactly zero. The following table shows the number of winning combinations, probability, and house edge of each Express bet. The total number of possible combinations is combin(37,3) = 7,770. It is easy to say that my advice is to stick to the single ball and neighbors bets, and any straight bet, with truly no house edge. The others carry a small house edge, despite the title. As with all Gamesys "no house edge" games, the player must pay a 10% commission on any net gambling session win. A "session" ends after a period of one hour since the last bet or 24 hours, whichever occurs first. No Zero Roulette Express counts as a "zero house edge" game, and the same commission rules apply as "No House Edge" Roulette Express. As the title says, there is no zero. On straight single-ball bets everything pays the same as standard roulette. Without a zero, the house edge every bet is exactly zero. The following table shows the number of winning combinations, probability, and house edge of each Express bet. The total number of possible combinations is combin(36,3) = 7,140. My advice on No Zero Roulette Express is to stick to the single ball and Straight bets, which are the only ones with truly no house edge. 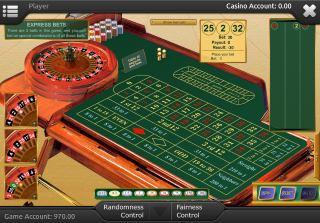 Double Ball Roulette — Land casino roulette game with two balls.